and Spot is off camera. 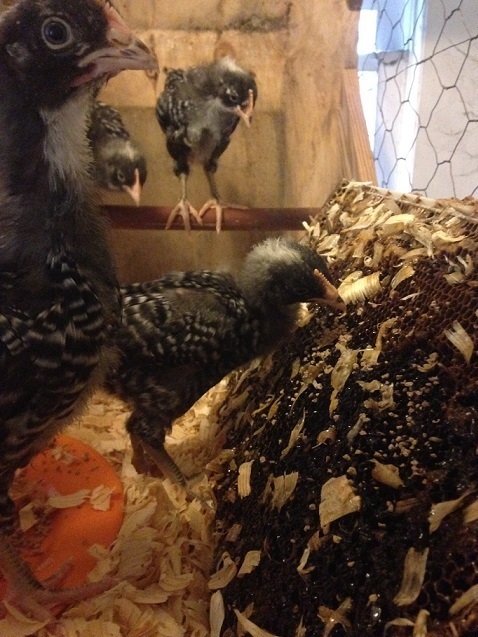 I like my chickens and my wife loves them but I have questioned my decision to get them since the day I bought them. Not because they are not a joy to own – they really are. But because I bought them to eat beetles yet they will not be big enough to go outside until bee season is over. However, when the beetles infested my new split, Noah had a capital idea. “Why don’t we feed them to the chickens.” And so we did! It was like throwing my enemies to the lions. The larva infestation was epic but my minions feasted on those unholy spawns like a pack of Velociraptors on tar-pit trapped Brontosaurus. Jen, Noah, and I all stood cage-side, watching the carnage with gleaming eyes of satisfaction. Though it was inaudible, I like to believe that the beetle larva were wailing as they were being devoured and I hoped that somewhere in my bee yard, a tiny tear was rolling down the face of a mother beetle.